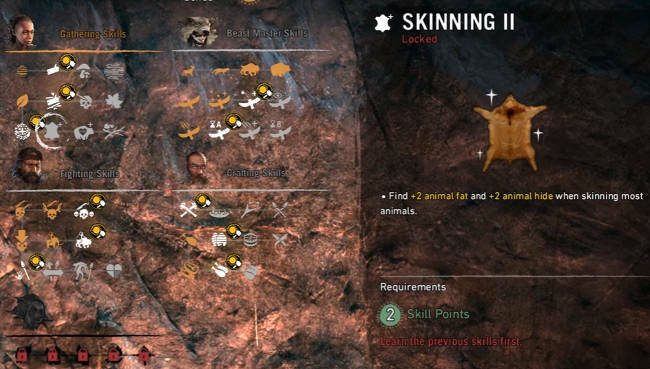 Choosing skills has got to be one of the hardest choices to make in Far Cry Primal. 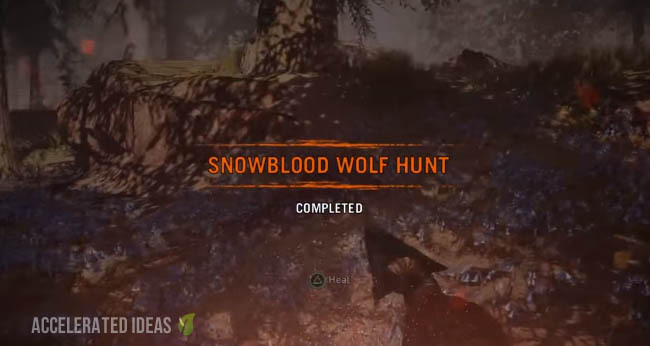 Do you spend you Skill Points early on and progress the Survival Skills and Gathering Skills or do you hold off for Beast Master, Hunting or Crafting Skills later. In this post I'm going to discuss the best skills to buy early in the game and explain my reasoning. If you're in need of more XP then check the fast levelling guide as well. First let's look at each of the Specialists and the skill groups they unlock. Players need to complete the appropriate main mission to bring a specialist back to the village at which point they have a permanent "hut". Note, it is only necessary to complete the first mission for each character to unlock the new skills group. Survival Skills - unlocked at the start of the game. Gathering Skills - unlocked early in the game. Beast Master Skills - complete Tensay mission. Hunting Skills - bring Jayma to the village. Fighting Skills - bring Karoosh to the village. Crafting Skills - bring Wogah to the village. Udam Skills - bring Dah to the village. Izila Skills - bring Roshani to the village. Each hut has two upgrades with the first upgrade requiring common resources whilst the second high level upgrade usually requires rare skins and a higher village population. Manually healing yourself saves alot of wasted animal meat which is essential for creating bait and taming animals. Taming animals is one of the best parts of the game and you must tame several animals before the Taming skills for Apex Predators and Cunning Beasts are unlocked. You will want these beasts early in the game so save animal meat. There's nothing worse than dying and starting over. The Extra Health 1 skill will give you an additional health bar taking your tally up to three. It might not seem like alot but one extra bar gives you more time to flee and manually heal rather than die on the spot. Gain twice the amount of animal meat from dead animals. This is well worth buying because animal meat = bait and bait = taming animals. You WANT to tame animals early in the game so don't waste time running round chasing goats and deer and get a double reward with this skill. Find twice as much animal fat and twice as much animal hide when skinning animals. I can't stress the importance of finding twice as much hide. There are a variety of Hut Upgrades that require skin and you don't really want to be hunting down animals because you don't have enough for the upgrade. Another extra health bar that takes your tally up to four. Again, more health is a good all round requirement to help you avoid unnecessary deaths which you will suffer from early in the game. Once you complete the first Specialist quests for Karoosh, Wogah and Jayma they will join your village and the Fighting, Crafting and Hunting skills groups are unlocked. You won't have the option to buy these skills early on but you should think about saving points from the start of the game. The first of the purchasable taming skills, Tame Wildcat lets you tame the following animals: Leopards, Jaguars, Cave Lions. The Jaguar in particular is great for silently clearing Outposts early in the game. This is arguably one of the best skills in the game. Having the ability to tame Sabretooth Tigers and Brown Bears will provide excellent benefits. In particular the Sabretooh is a strong companion that you can also ride to avoid walking everywhere. 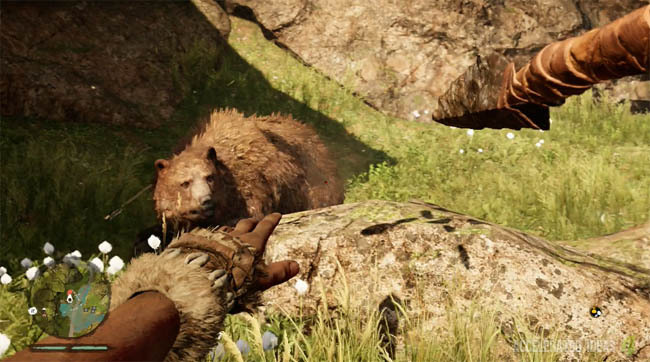 The Brown Bear is a tank beast that attracts enemy fire, making him the perfect ally for Outpost captures. You'll have to buy the Mammoth Rider skill (2 points) before you can buy Beast Rider (2 points) but this skill allows you to ride the fastest (and best) beast in the game - the Sabretooth Tiger. They'll be no more walking anywhere once you've unlocked this skill and tamed that companion. An expensive skill to buy because it's at the end of the skill tree but having double spears is something to really consider. Later in the game you'll come to realise that Spears are the best weapon you have, whether you stab for heashots or throw several in quick succession, this weapon is a deadly choice. The three successive upgrades to the bow weapon will each double the number of arrows obtained through the crafting wheel. 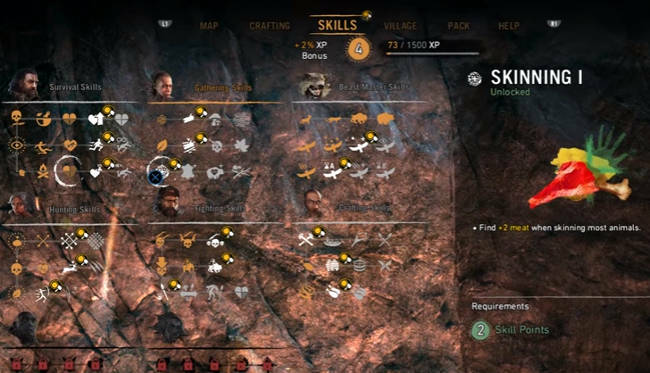 By the time you've bought the Craft Arrows 3 skill you'll be able to craft eight arrows in one go rather than a single one as you did at the start of the game. Although the bow isn't as effective as the Spear, it's still ok for long distance kills when enemies are grouped together or in hard to reach locations.